Craft: What I used to create this image was Adobe Photoshop. I imported the images that I scanned onto the computer. The textured images are of a hand towel, football jersey, a dress shirt, and a leaf. After placing these images in photoshop I used the magnetic lasso tool to cut out the image from its white background. I also used the regular lasso tool to create the abstract shape of the tree. For the change in the grass color I clicked on Images then Adjustments, and went to brightness and constant to change the towel from blue to green. Once this was complete I created the fence, I changed the color using the hue and saturation under the Adjustments menu as well. I used the rectangle marquee tool to crop out the shapes of the fence. I cut out one fence post, and one long piece for the horizontal part of the fence then just duplicated those pieces and put them together to form a fence. The background is the image of a leaf that I rotated to look like sun rays. Concept: The concept of this image was to use textured fabrics and things found in nature to scan into the computer to create a collage. My collage is of a individual apple tree. I wanted the pick shirt to be used for the apples since it was already the right color. 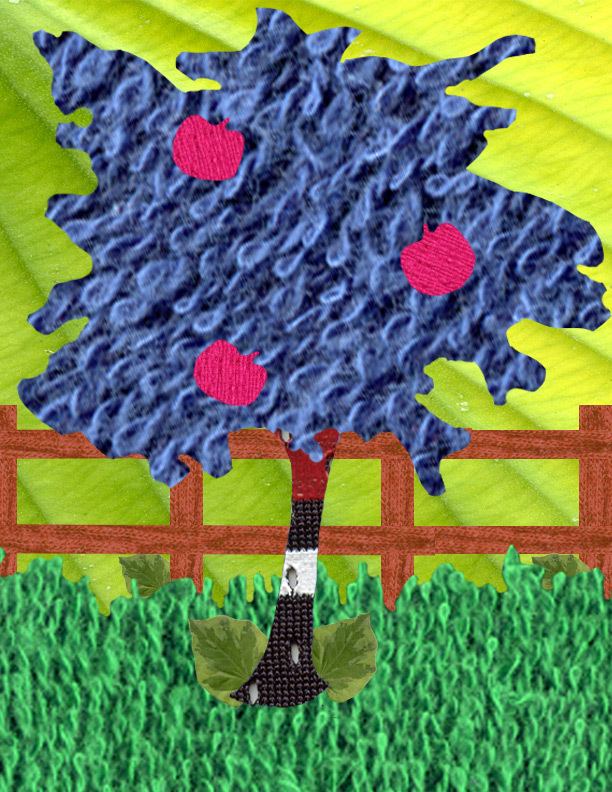 The reason the tree is blue is because I wanted to use the original color of the towel before I used that texture again. I incorporated my football jersey into the trunk because the holes in the jersey are similar the the bums and texture that would be found on tree bark. I also wanted to use the zoomed in view of a leaf because if look just like sun rays and it went well with the idea of a apple tree. It gives that final touch that makes the image look as if it is in the middle of a prairie or an orchard and the sun is shining over head. Composition: This image is composed of three textured items and two leaves. 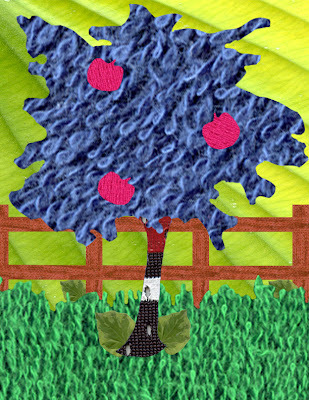 The textured items are set up in such a way to represent grass, a fence, and a tree. The leaves were set up to represent two different things. One leaf is used as the actual plant. It is positioned at the bottom of the tree and the fence posts to resemble weeds. The other leaf is positioned in the background as the light from the sun.